Now, I'm sure you see it clearly now. 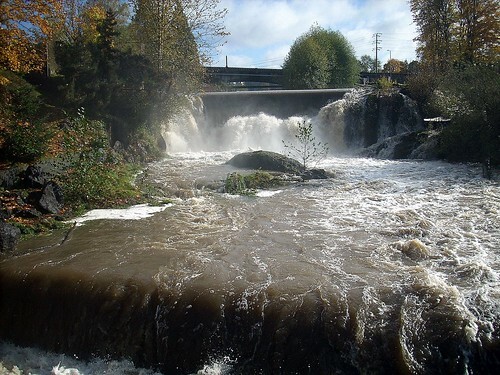 But, what a lot of people call the upper waterfalls on the Deschutes in Tumwater is actually a derelict dam. It is also (according to my list) the oldest dam in Thurston County by nearly 40 years. There are a surprising number of dams in Thurston County (35 total), now that I think of it. All but one were built in the last 100 years. The busiest decade for dam building was the 1960s (with eight built). I'm also surprised by the number built in the 1980s and 90s (five each). The stormwater pond dam over at SPSCC has a surprisingly high risk rate, "From 7 to 30 lives at risk." Most of the dams -- 15 out of 35 -- are both earth fill and were built to create recreational reservoirs. Three of these actually have "ski" in their names. There are also dams in surprising places, Grass Lake for example. This is a small lake surrounded by a City of Olympia park. The dam was built in 1966 for the original purpose (I assume) of irrigation. Grass Lake dam illustrates what I take away from the list of Thurston County Dams. Most of us read the word dam and see the Elwha dams, the Grand Coulee or even our own La Grande Dam. Something big, blocking a big river. But, most of these dams are smallish, practically fading into the landscape. You don't even know a dam is there. Interesting map! Thanks for consolidating this information. One of the bios at the SPSSEG told me that you can still see the headworks from a road down there.